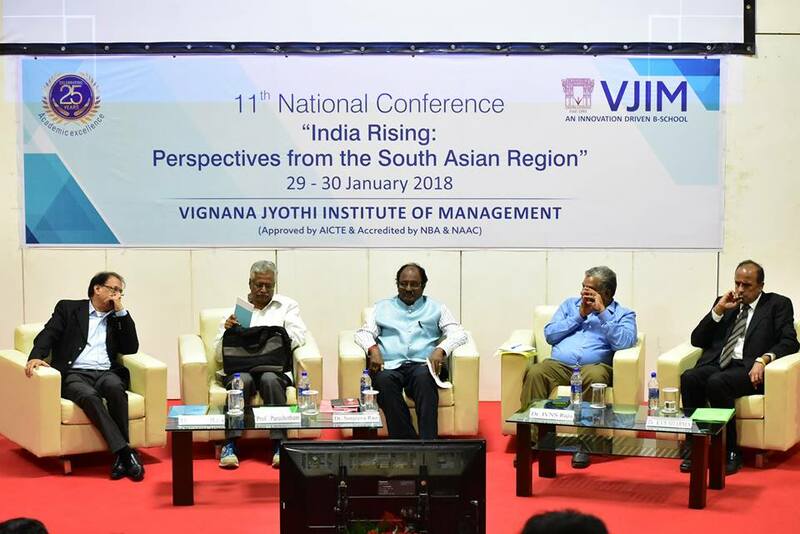 Vignana Jyothi Institute of Management (VJIM), Hyderabad recently hosted its 11th National Conference on “India Rising: Perspectives from South Asian Region” in the presence of renowned names from different industry sectors and academia. Held on 29th and 30th of Jan, the topical conference was high on relevance as it focused on the growing might of India, which has been bolstered by initiatives like Make in India and Digital India. As Indian brands take on global powerhouses, intra-regional trade in South Asia needs to reach its highest potential. These were some of the questions raised and answered through eye-opening discussions in the two-day conference. With Mr. Mahendra Raja Ram, Disaster Risk Reduction Officer, UNICEF as the Chief Guest and Mr. C V Raju, Head Distribution, Nigeria, Bharti Airtel Ltd, Retired, as the keynote speaker, the conference was inaugurated in a star-studded ceremony. Dr. Ch S Durga Prasad, Director, VJIM and Dr. A S Rao, Director Centre for Project Mobilization and Globalization, Vignana Jyothi addressed the gathering and put the theme of the conference into perspective. Over the course of two days, experts deliberated and discussed four sub-themes that streamlined the learning for all participants. “Building Social and Physical Infrastructure” was the first topic that was discussed by Dr Vijaya Bhavani, State Project Officer, UN Women, AP, Mr. D. Suresh, Dr. Reddy’s Foundation, Hyderabad and representative from L&T Metro, Hyderabad. The latter talked about the metro project in Hyderabad, voted the most liveable city in India in Mercers Report. Dr. Bhavani then spoke about Gender Equality and its role in Building Social Infrastructure. Mr. Suresh delved into his own experiences working with the Foundation that focuses on learning and development. The stimulating discussion has several crucial learnings for the audience. The session on “Leveraging the Demographic Dividend and Fostering Governance and transparency” had Prof. Paritala Purushottam, Adjunct Professor, Centre of Economics Social Studies, Hyderabad, Dr. A M Rao, Vice President, Corporate, Satyam Venture Engg. Services Pvt Ltd, Tech Mahindra, Hyderabad, Mr. M Sanjeeva Rao, HR Professional and Trainer on soft skills and Management Systems, Dr. I V N S Raju, General Manager, Corporate HR and Admin, Renew Sys India Pvt Ltd, Fab City, Hyderabad and Dr. K V S Sarma, Prof. Law, National Academy of Legal Studies and Research on the panel. The discussion shed light on demographic dividend, lessons from China and other Asian countries, and ways to tap into Demographic Dividend, Economic Growth, Employability, Gender and Demographic Evolution. Day 2 of the conference carried the tempo of the discussions with the first session on “Institutionalization of Financial Reforms”. With seasoned speakers like Mr. Shankar Suman, GM – Banking Supervision, RBI and Mr. B. Srinivas Reddy, Managing Director, Wealth Aggregator Financial Services Pvt Ltd. on the panel, it wasn’t surprising that participants were taken through different stages of banking reforms, financial markets and reforms in industrial sector in a simple yet effective manner. Students in the gathering realized that reforms are launch pads for the social sector, including agricultural sector, SME’s and marginalized weak sectors. The final session on “Reimagining an Education Eco-System” was helmed by Dr. K. Panduranga Rao, Group Head – HR, IVRCL, Dr. Sekhar Murthy, Director, IIC Technologies and Mr. R K Dinavahi, Board Member, NHRD. Dr. Rao made a valuable point when he said, “Educational qualifications are important for your success but attitude, vision, physical health and communication are also crucial.” Dr. Murthy talked about ‘Disruptions in marketplace and Digital age education’ and suggested, “The educational system should connect to the students by talking their language.” Finally, Mr. Dinavahi urged students to go beyond textbooks, learn from their experiences and shine in the field they choose. His words were held true for the conference, which created an immense learning experience for students on topics that are timely and vital for managers of the future. We would like to invite your attention to the following differentiating factors about VJIM: VJIM is ranked as 21st best B-School in the country. (Source: Indian Management – AIMA & Business Standard, May 2013 Issue). VJIM has repositioned business education and hones your skills based on the best global business practices with global curriculum and its application adapted to Indian business environment. VJIM has pioneered the concept of reverse orientation for second year students so as to reinforce the concepts taught in the first year. The institute follows international pedagogy such as Process Oriented Guided Inquiry Learning (POGIL) and Socratic dialogue for teaching and learning. We encourage meritorious students by giving the scholarship for CAT/MAT/XAT/ ATMA The institute is consistently placing students in companies such as Deloitte, Google, Naukri, Info edge, Wipro, Cognizant, DE Shaw & co, Axis Bank, KVB, HDFC, Bank of America, Deloitte, TATA Projects, HSBC etc. We offer sectoral electives in the areas of Business Analytics, Pharmaceuticals and Banking Financial Services and Insurance (BFSI). The B-School has interdisciplinary learning aimed at creating competent managers. The institute conducts Economic Times analysis sessions on daily basis, aimed at wedging gap between theory and practice. We have excellent infrastructure with high end information technology support and state of the art Learning Resource Centre. VJIM has research centric faculty with industry experience and excellent teaching ability. Institute conducts industry immersion program for all faculties for exploring current industry practices and bringing it to class room.